Prompted by my friends over at the Liberal Gun Club, this is another in an occasional series of revisiting some of my old articles which had been published elsewhere over the years, perhaps lightly edited or updated with my current thoughts on the topic discussed. This is an article I wrote for Guns.com about six years ago, and it originally ran without a byline as an “Editor’s Review” for just the M-series guns. But everything I said in that applies to the S-series, which are just a half inch shorter in the barrel and grip, so I have tweaked the content accordingly. Images used are from that original article. Some additional observations at the end. The first “plastic” handgun I purchased was a Steyr, an original model S9. Since then I’ve owned or shot almost all the different models that have been available in the United States. I love these handguns — just want to get that bias out in the open first thing. The Steyr M and S-series was first available here in the late 1990s. 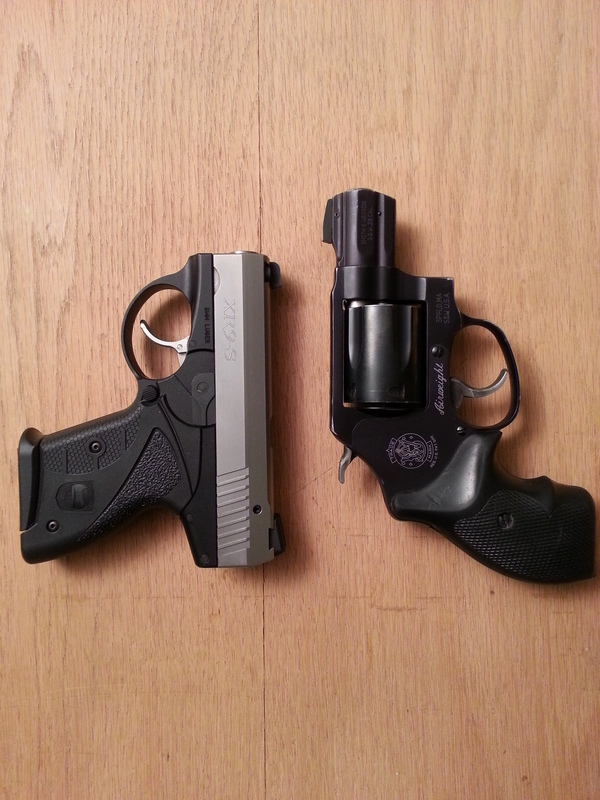 Initially they were available in 9mm and .40 S&W (the M/S9 and M/S40 models, respectively) and then later in .357 Sig. Minor revisions were made to the design in the mid 2000s, which eliminated the manual safety, tweaked the grip shape slightly, and included an integral rail system under the barrel housing. These models were given the “-A1″ designation. Just recently Steyr made some additional minor changes to the operating mechanism, but maintained the “-A1″ designation. A lot of handgun owners and reviewers actually considered the Steyr to be very competitive with the Glock guns, their equal if not superior in design and manufacture, and of a similar size, weight and capacity – in the case of the M-series, to the compact Glock models. But Steyr Mannlicher really screwed up their introduction into the US market, leading to shortages, unreliable service support, and few available parts and accessories. For this reason the guns didn’t catch on with the general firearm-owning public, the brand was tarnished, and these guns went for a substantial discount. When I bought my first Steyr new, I got it for about half what a similar model Glock was going for. Twice now Steyr Mannlicher has tried to re-introduce these handguns, and I think this time they may have gotten it right. Currently the M-A1 series is going for about the same price as similar Glock models. 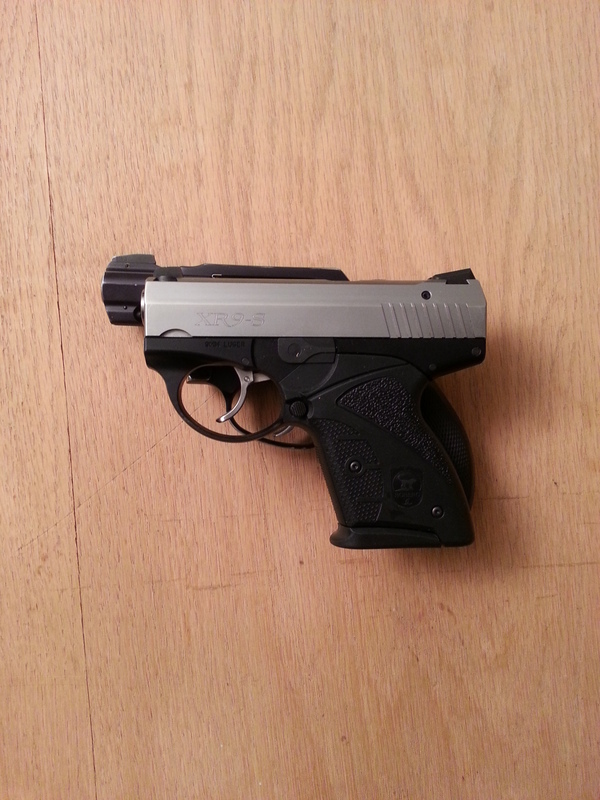 So, what do I like about the Steyr handguns? They shoot great. They have a very low bore-axis, meaning that the position of the barrel relative to your hand is close – this minimizes muzzle flip, allowing for less perceived recoil and easier follow-up shots. I consider the ergonomics superior to the Glock – they have a different grip angle that just points more naturally for me. The unusual trapezoidal sight system is very intuitive, and leads the eye to quicker target acquisition. 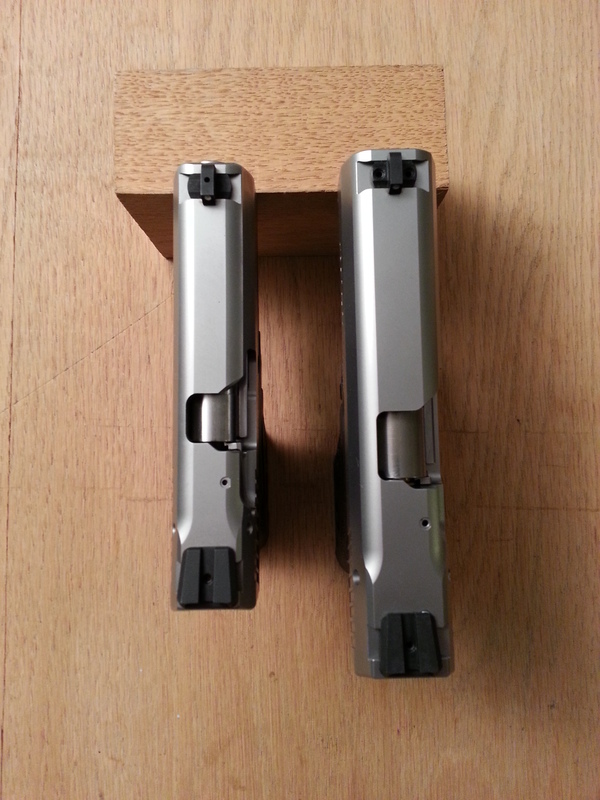 The guns are very well made, with excellent fit and finish of all parts. The trigger is a DAO – what Steyr calls “Reset Action”, which means that it is partially pre-cocked (about 72 percent) giving a shorter trigger pull with about 5.5-pound pull. This makes for faster shots with less motion. The -A1 series has multiple safety systems – internal, external, and a key-lock for access control. The older series also have a manual safety, which I personally like, but it can be ignored or even removed without presenting operating problems. Dislikes? Well, as far as I know, there is no option for lefties – no way to easily operate the slide lock or magazine release with the left hand only. Accessories are still pretty limited, though the folks over at the Steyr Club have pretty good lists of what is available and adaptable. And one odd thing – once when racking the slide on my M357 my hand slipped, and my thumb caught in the rear sight – the trapezoidal structure snagged and ripped my thumb up pretty good, putting my shooting for the day to a nasty end. So, if you get a chance, give a Steyr a try. Everyone who has shot mine has really liked the guns a lot, and more than a few have gone on to get their own. I now only have the original S9 I got, having passed along the other models I had. But I still carry this gun a lot, I find it so reliable and comfortable. I have upgraded the sights to TruGlo TFOs, which I have done for most of my CCW firearms. I loved the original trapezoidal sights, but the TFOs are much easier for my aging eyes in any light conditions, so it was a good change. Steyr has added a couple new models to the line — an “L” for Large/Longslide, and a “C” for Compact/Concealed (basically, an S barrel and an M frame/grip) — but they still haven’t really figured out how to market the guns for the American market. So they’re still relatively unknown, which is a shame. I’ve come to appreciate Glocks in the last few years, and own several, but still think that the Steyr line of handguns are at least as good and usually a better price deal. YMMV, of course. Prompted by my friends over at the Liberal Gun Club, this is another in an occasional series of revisiting some of my old articles which had been published elsewhere over the years, perhaps lightly edited or updated with my current thoughts on the topic discussed. This is an article I wrote for Guns.com, and it originally ran 3/26/2012. Images used are from that original article. Some additional observations at the end. And I did exactly that. Here is a follow up review. You may be asking: Why a pair of Bobergs? 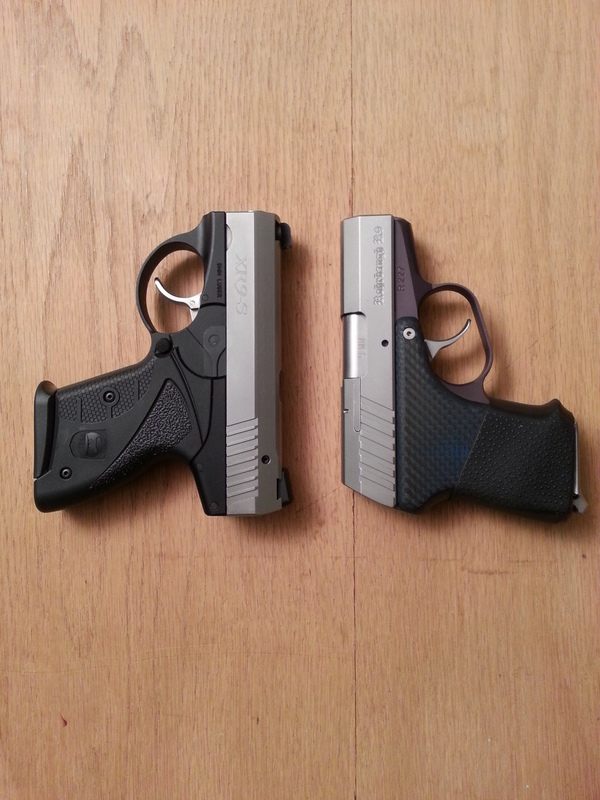 Because my buddy is of the opinion that having two is better than one when it comes to concealed carry guns. If you can do it, it makes a certain amount of sense. 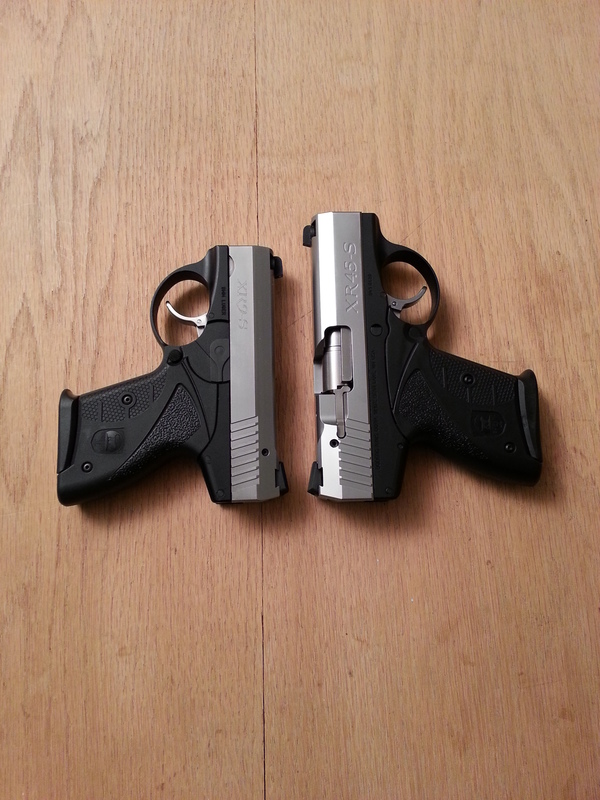 Two identical guns means that you only have to be aware of one operating system. You can carry both guns so that it is easy to draw one or the other depending on the situation (which hand is free, et cetera). Lastly, drawing a second gun is faster than reloading or having to go through remedial action. There’s also the practical idea of having a second gun for parts, so if perchance something happens to the company then the guns and parts may be hard to come by. I don’t think that is likely in the case of Boberg Arms, but it does happen, particularly to small companies. So, as a hedge, my buddy ordered two of the guns figuring that at worst he’d wind up selling one or both later to recoup some of his investment. The first time we shot the Boberg, it was literally a case of taking the gun out of the box, reading the manual as we loaded it and shot it. There was little or no preparation or inspection—we just wanted to see what it felt like. Not something I would usually do, but the gun had just arrived at the FFL the day before and my friend picked it up on his way to visit. This time was a different matter. The first gun had been cleaned, but not shot again after the last outing. 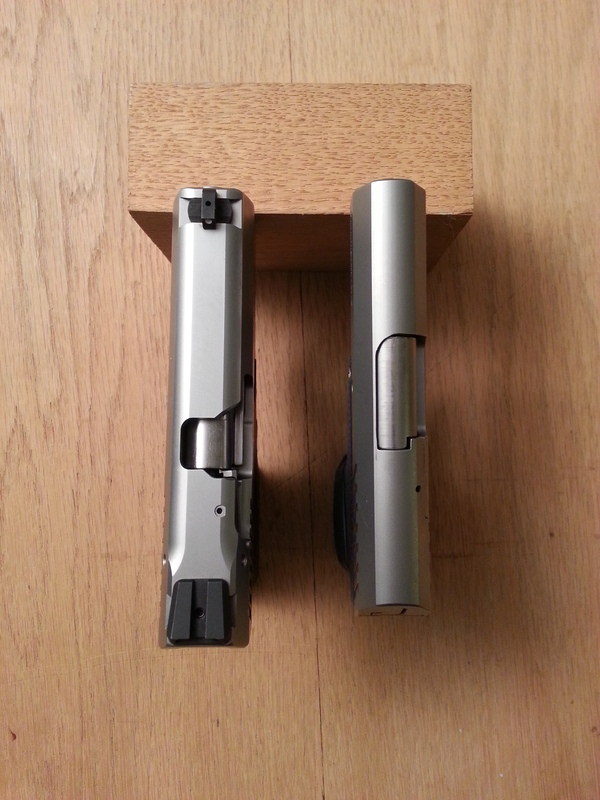 This time we field-stripped both guns, inspected them and lubricated them as recommended in the manual. We opened up the magazines, gave them a quick wipe down and reassembled them. Finally, we opened up a 250 round box of 115-grain target ammo (ball) and commenced to loading magazines. Excellent. Again, the fit and finish is very, very good, in keeping with what you would expect from a high-end pistol. The three-dot sights are good and easy to use in low light (where we were shooting this time). Accuracy is very good for such a small gun. The best shooter of our small group (who wasn’t with us last time) was able to keep rounds in about a three-inch group at 11 yards. I mentioned in my first review that we had some minor glitches with the gun not going completely into battery. That didn’t happen with the gun we shot previously, but it did happen with the one right out-out-of-the-box. Meaning before it functions at 100 percent, you need to run a few magazines through it. We ran about 50 rounds through each gun, then took them down and did a quick cleaning and inspection. After the normal light lubrication and putting the guns back together, we didn’t have any problems again with either gun. Or, I should say, we didn’t have any problems with them functioning again. Like the last time, the front sight on the new gun fell off about 25 rounds into the session. But this time we had brought an allen wrench of the proper size to remount and secure it. Otherwise, both guns shot like champs. We took turns loading and shooting each gun, one right after the other, until we had went through all 250 rounds of the target ammo and 50 rounds of JHP self-defense +P ammo. When we were done, we again field stripped them and did a quick cleaning and inspection. There was no obvious wear and the guns weren’t very dirty. Pretty much what I said before: “This gun is a winner. It is well designed, and well made.” And I was quite right about what it would be like to run a bunch of rounds through it: no problem at all. Each of us shot one or the other of these guns about 100 times. None of us had any problems at all with hands hurting or feeling abused by recoil. That alone is astonishing—I know of no other pocket pistol that I would be willing to do that with as a regular thing. With the Boberg, I wouldn’t hesitate for a moment doing it. I know, like last time, someone is going to complain about a $1000 gun having the front sight fall off. Please—this is a completely trivial problem and one easily rectified by just checking to make sure the set screw is tight before you shoot. It’s one of those little things that should be caught by the manufacturer, but given how well the gun is put together and performs otherwise, I’ll cut ‘em some slack. I’m more impressed than ever with this gun. In my initial review, I gave it a 4.5 star rating. Now I’d move that up to 5 stars, and wish I had further to go. I’ve now owned one of those two Bobergs for several years. And in that time my experience and opinion has evolved somewhat from the article above. First and foremost, Boberg Arms was sold to Bond Arms early last year. They tweaked the design slightly, and made some changes to gun, and came out with what they now call the BullPup9. I haven’t shot one of those yet, but I did discuss the changes with Bond Arms and agree with the decisions they made. And in my experience the Bond products are all very well made, so I wouldn’t hesitate to recommend the new pistol to anyone. One thing I have come to learn about the XR9-S is that when chambering a round, it is critical that the slide is racked all the way back with significant force, and then released. If you do not draw the slide back with a snap, a round will only be lifted from the mag about halfway, and then will be caught behind the extractor. And if you try to ‘ride’ the slide forward, there’s a fair chance that the nose will drop down under the chamber and lodge tightly. Either problem can be corrected in a few minutes with simple tools, but it definitely takes the gun “out of the fight” for the duration. I always caution people new to the gun about this problem, but still about a third of them will make this mistake at least once. Usually, once someone gets the hang of it, they don’t have a problem. And it is important to note that in normal operation, the gun cycles without any problems, chambering a new round from the magazine reliably. But this is still an important consideration in choosing a self-defense gun, and I would not recommend that anyone with poor hand strength (needed to rack the slide with sufficient force) choose the XR9-S.
To the best of my knowledge, there are still no after-market sights available for the XR9-S/BullPup9. I sent my front sight to a gunsmith friend, who turned it into a nice fiber-optic sight, but that’s about the best you can do in terms of improving the sights. I do still love the little XR9-S, and I carry it a fair amount of the time. In terms of power and shoot-ability, it’s one of the best very compact packages out there. But it is a niche gun, and not suitable for every person or situation. So if you’re tempted, or intrigued, be sure to try one before you buy. 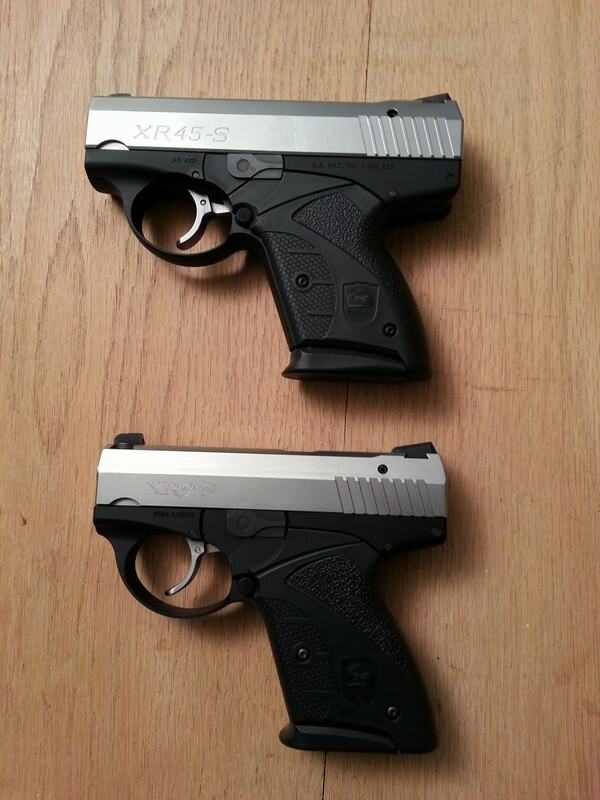 Boberg XR9-S: a new little brother for my XR45-S. I knew when you got the 45 you wanted the 9mm too. It was only a matter of time. 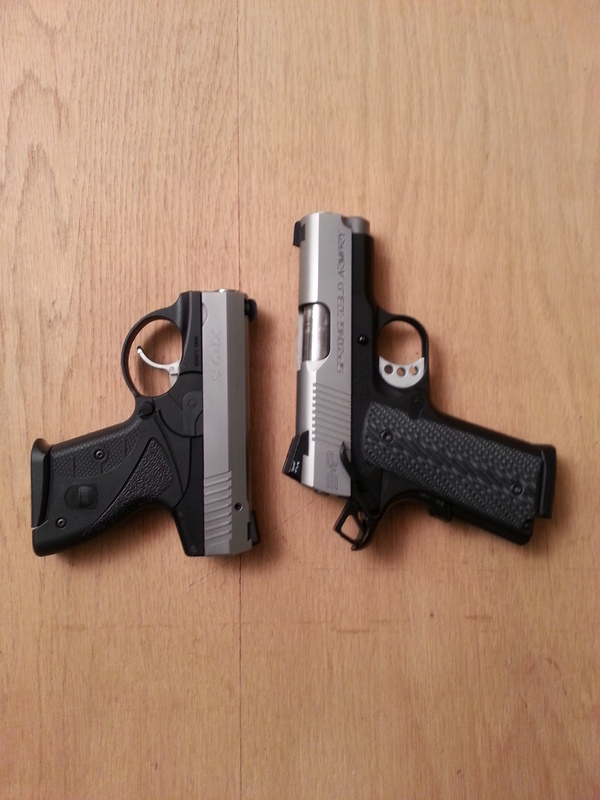 Yup, a Boberg XR9-S: a new little brother for my XR45-S. As I did in that post, I thought I’d put up some comparison pix to give a sense of just how small this gun is, even though it really doesn’t feel like it when you hold it or shoot it. Lastly, here it is with a Bond Arms derringer — a great little gun, with a variety of different barrels available. 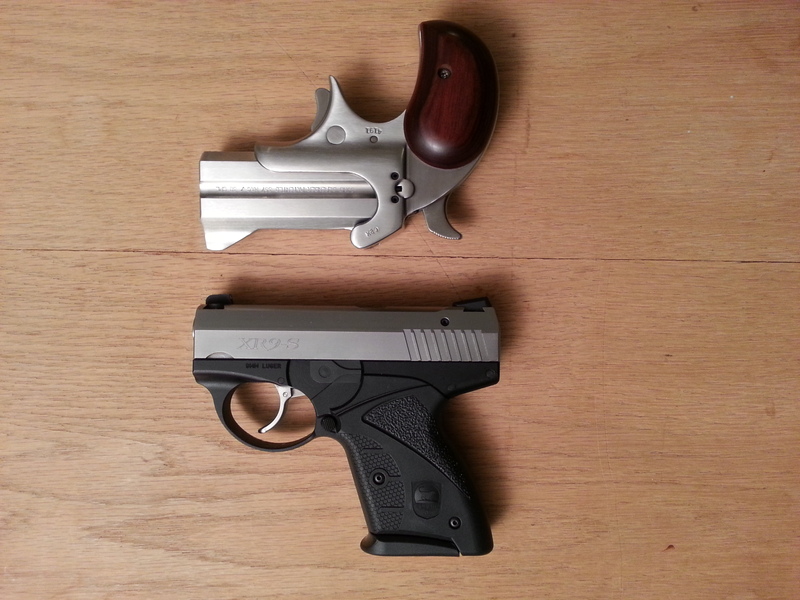 But there’s still just two shots in the derringer, and it actually weighs about 3 ounces more. While I have shot this gun (it belonged to a good friend), and know it to be dependable, I do still want to make sure that it will be able to reliably digest my preferred SD loads. So more on that to come!